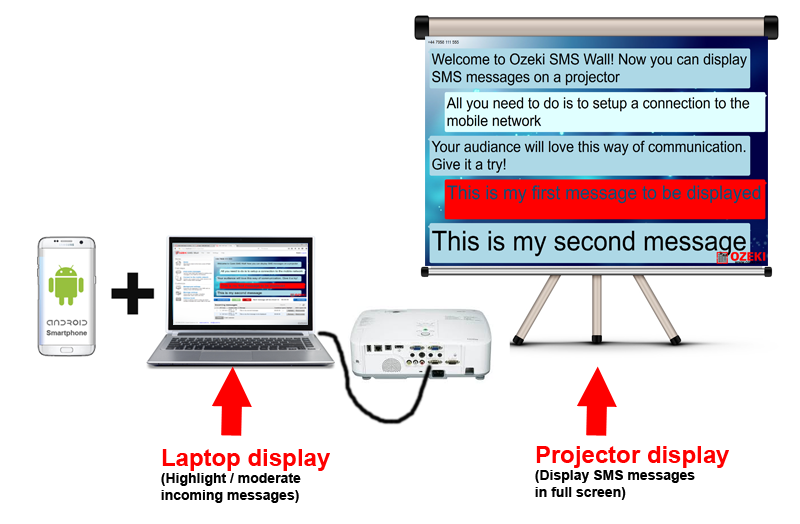 Ozeki SMS Wall can be used to display SMS text messages with a projector or on an LCD TV. It makes it easy for your audience to share information or ask questions. It is often used on conferences and on other events. This Text to Screen software is also perfect for operation centers, central commands and control facilities where incoming information needs to be displayed on a projected screen. 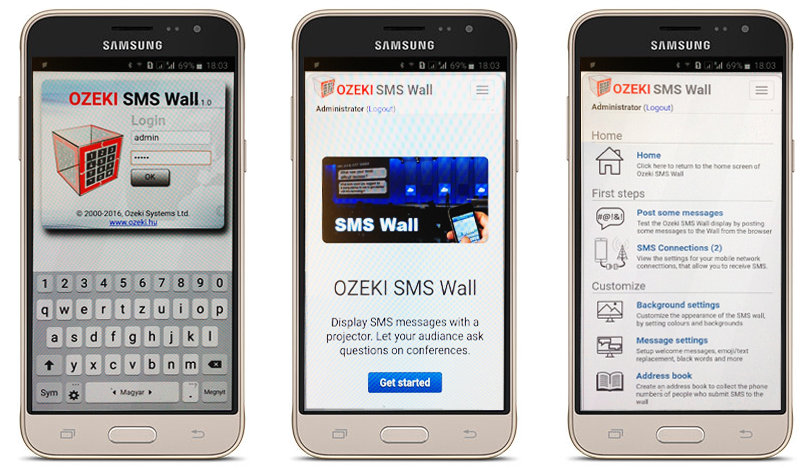 Download Ozeki SMS Wall Trial! 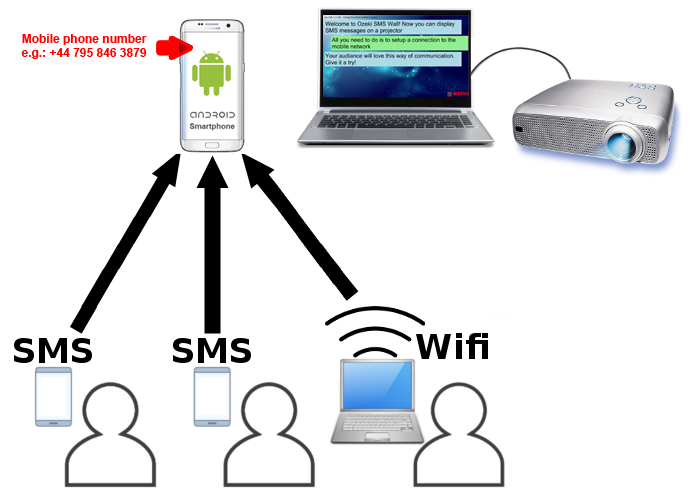 To operate Ozeki SMS Wall all you need is an Android smartphone and a laptop. Once you install the software on the smartphone, it can forward incoming SMS text messages to the laptop. A projector or LCD display can be connected to the laptop computer to display the messages. Your smartphone has a SIM card that has a phone number. SMS text messages should be sent to this phone number. You don't need to sign up to any service and you don't even need mobile data or a mobile Internet connection. It is very simple. You put the SIM card into the Android Smartphone and people can send SMS messages to it. These SMS messages will be displayed on the projector. To make it even better, you can turn your Android smartphone into a Wifi hotspot and you can allow messages to be posted over Wifi as well. 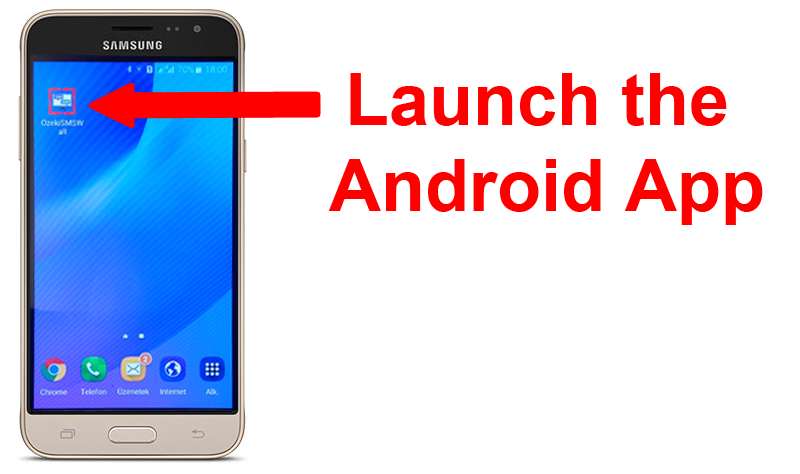 After installation you will find it on the Android applications menu. To use the SMS Wall on your Laptop you need to create remote connection. 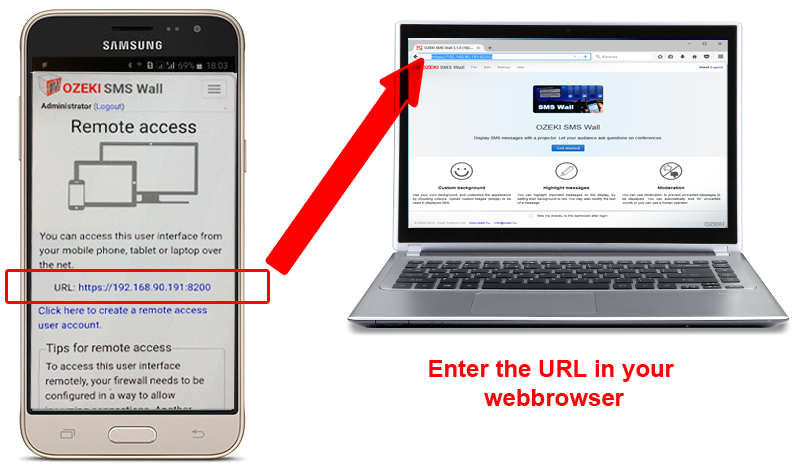 If you open the Help/Remote access menu item on your mobile you will find a URL. Copy this URL into the address bar of your webbrowser (Chrome or Firefox) and you will see the software interface on the laptop screen. Ozeki SMS Wall has a webbrowser based user interface, that can be accessed from a laptop or a desktop PC. When the software is installed on the smartphone, a webbrowser can be used to connect to the smartphone, to display the messages. 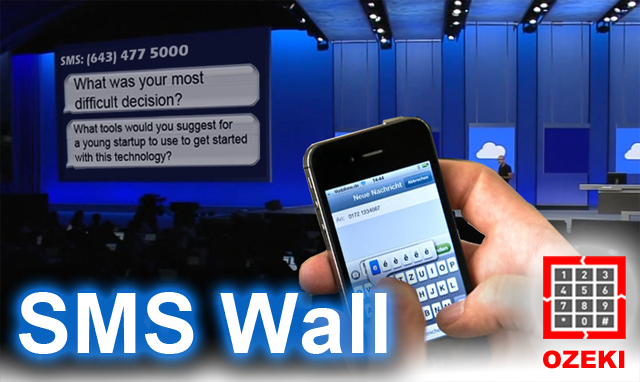 The browser based user interface can be used to customize the appearance of the SMS Wall and it can also be used to display the messages in a full screen mode. In most setups two browser windows are used. The standard user interface is displayed in the first browser window to allow message preview, highlighting and moderation, and the second browser window is displayed in full screen mode on the secondary screen, which is the projector. In command and control centers one of the most important features of Ozeki SMS Wall is the ability to highlight incoming SMS messages. This way important messages can be marked. Highlighting a message is very easy. All you have to do is click on the 'Highlight' button next to the message text. You can upload your own background image, you can change the colours and the appearance of the messages, and you can select the preferred animation method to display new messages. You can add the mobile phone numbers of the people who post messages to the wall to your addressbook, and you may send a reply SMS message to them. This way you can advertise to your audiance or you can notify people when needed.